I thought that this one would be a really fun, light read. I like the cover and the premise sounds interesting enough. I mean, how many people get the chance to talk to ghosts? I do feel that paranormal stories, however, are everywhere and it's hard nowadays to make it original. I honestly prefer books written in the guy's POV. I'm not entirely sure, but I just suppose the guys don't have the long, clique-y, insecure internal thoughts. Readers really dodge the bullet in that department with the guy's POV, but Jeff didn't really stick out that much to me. There wasn't that much dimension or growth in his character, and he was extremely moody. Now, I've had my fair share of imperfect characters that I absolutely adored, but Jeff didn't fit the bill. There wasn't that original quality to him, or at least a sense that he was real. And this pretty much applied to all of the other characters. Kimberlee with two "e's" wasn't very likable, and I felt that I barely even got to meet Sera because that was how fast Jeff and Sera's relationship moved. I felt as if there was a bunch of amateur actors trundling across the pages. Nothing felt deeper than substantial. Scenes with witty banter felt forced. Lifeless. Dull. The book essentially followed the same direction of the characters. The plot was barely alive and, while I finished the book, I lost interest early on. I thought that I would enjoy this one, possibly even fondle it a little because the story would be cute and all, but it didn't connect with me. 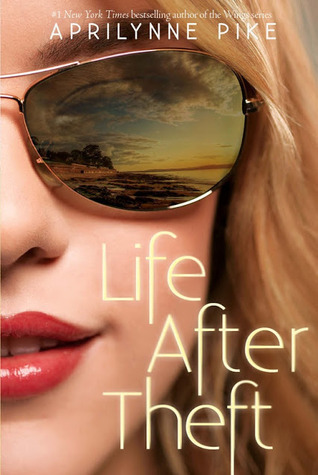 Life After Theft could definitely be an enjoyable book to some, but for me, the whole story fell flat. I like that Pike included the adolescent struggles to fit in throughout the novel, but other than that, I didn't like much from this book. I've seen this kind of plot all over, and I understand that this is a retelling, but I wasn't blown away with it. I'm positive that some will enjoy this book, but Life After Theft was not the book for me, unfortunately. I'm 80 pages into this one so far, and I'm not a fan. I really hope it picks up or it will be a DNF for me. I felt the same way! Especially about the relationship, which was insta-love at best. Alas, there are better books in the sea!